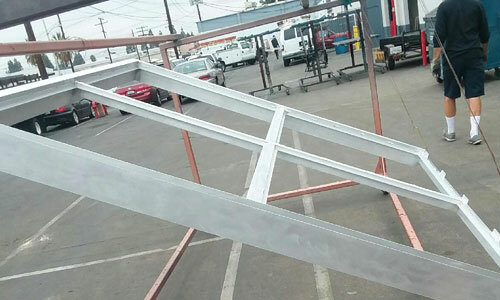 For the best in sandblasting and bead blasting, choose Orange County Powder Coating. Since 1959, we have been delivering exceptional, competitively-priced metal resurfacing services to tens of thousands of residential and commercial clients throughout Anaheim, Yorba Linda, Huntington Beach, Tustin, and surrounding cities. Our expert staff has over 60 years of combined industry experience, and can sand or bead blast a full range composite metals, including aluminum, steel (copper plate and buff), magnesium, stainless steel, pot metal (die cast), brass, and tin. We offer specialized resurfacing techniques, such as light sandblasting and brush sandblasting, and can also sandblast wood to remove stains or give it a beautiful weathered, aged, or distressed look. With multiple on-site blasting booths, powerful equipment, and extensive hands-on experience, we are the preferred choice for cost-effective resurfacing services in Orange County. We regularly work with contractors, interior designers, and engineers for well-known national companies like Starbucks and Forever 21. In addition to handling projects for large commercial and industrial clients, we frequently work with residential customers who may only need one or a few items sandblasted, such as a rusted bicycle frame, lawn chair, garden bench, or motorcycle parts. Abrasive blasting is often a necessary pretreatment prior to powder coating. However, if done incorrectly, blasting can severely damage the integrity of the metal, lead to an uneven finish, or result in corrosion resistance or adhesion issues. That’s why our experienced staff always uses the industry’s best practices for blasting, starting with determining the optimal type of resurfacing method for the job, usually by interpreting engineering, hospital, or military specs and assessing the metal items first hand. Once we determine the best method for resurfacing your items, we put them into one of our abrasive blasting booths, where a hose shoots out sand, glass beads, or steel grit. This method safely yet effectively removes old paint, oils, dirt, rust, and grime. By carefully monitoring the entire process from preparation to completion, we produce a clean, smooth surface that is ready for whatever application you require. At Orange County Powder Coating, we want you to be completely satisfied with any sandblasting or bead blasting services you receive from us. We make every effort to provide the best blasting services in Orange County. With our "no-attitude redo program," if we are at fault for any problem, you can rest assured that we will work quickly to resolve it at no cost to you. Call or stop by today for a free quote from a member of our friendly and knowledgeable staff. We also offer on-site assessments for contractors and engineers, delivery services, and rush order services upon request.